You can make your own NEO motor in the calculator. Just go to the Data tab and enter in the stats for any motor you want, and they will populate in the drop down cells for each tab you use. You can just download it and then upload it to your Google Drive. No need to have Office locally. Hadn’t tried it yet but wanted to ensure it doesn’t lose any functionality. I’m planning to keep the links at https://johnvneun.com/calc updated. I just fixed them to reflect the changes to Chief Delphi. JVN’s calculator works fine after import in my experience. Some of the image/text formatting goes weird is all, don’t let that scare you. 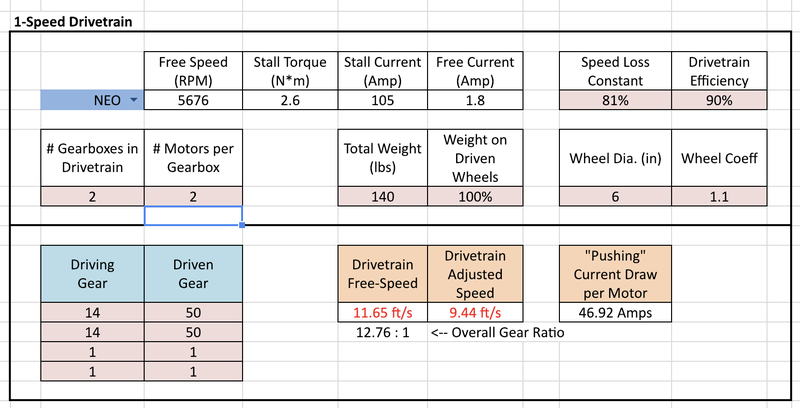 The iterative-calculators for sprint distance that Ari and Alpard have built in Excel (at separate times) do not work in Google Docs. Fortunately, Aren & Dillon’s calculator is native to Docs and does Follow SPang’s link above. Aren & Dillon’s calculator goes into significantly more depth, so I find JVN’s easier to teach with more inexperienced students - basically, JVN makes a larger number of invisible assumptions, on things that don’t matter to >95% of teams, so we can move faster to answer questions like “what gears do I need to use 6” wheels to move 14fps" instead of getting side tracked on exact DC wire sizes and run lengths.